Flor Patisserie by Chef Yamashita is a new Japanese Patisserie in Singapore. The talented chef was previously from the ever-popular Patisserie Glace, left and set up his own dessert place at the quaint Duxton Hill. I wouldn’t call the Napoleon ($6.20) a cake since it has a bigger proportion of puff pastry to cake. But this is exactly what I love about the Mille-feuille. 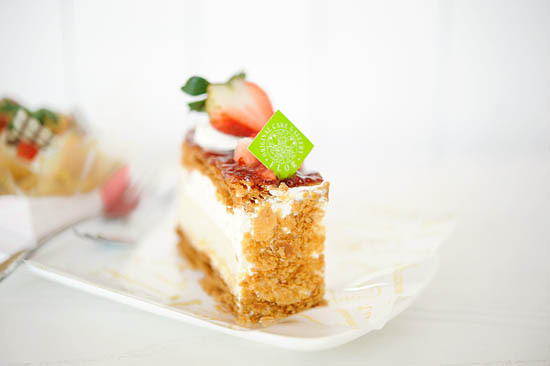 Flor Patisserie’s rendition has a layer of cake in between the layers of puff pastry and cream. I love how the puff pastry crumbled in the mouth together with the cake and cream. During his stint at Patisserie Glace, Chef Yamashita’s Strawberry Souffle ($6.5) was so heavenly that it was something I must order with every patronage. I am usually a generous person, and sharing is a form of love to me. But you cannot say the same for Strawberry Souffle because no one is to fight with me over that dessert. I would peg that as inhumane. Essentially an open-faced cream puff, the Berry Choux ($6) uses Flor’s special pastry cream, fresh cream and berries. However, I wouldn’t pay six dollars for Patisserie Flor’s choux pastry since I can buy two of the best cream puffs at Tampopo Deli for the same price. Baked till golden at its most precise perfection, the Mango Pie ($6.0) took us completely by surprise. Atop the pie sat the rich-coloured mango, looking pretty from all angles and our appetite were instantly whet from its delightful appearance. But apart from its superficial beauty, we were not expecting Heaven from the tart – or what the chef calls a Pie. Let’s make this clear first – the mango pie isn’t the regular ‘perfect 10′ dessert you would fall in love at first sight. The one that I had grew on me after a few bites. I was so greedy about them that I took to licking my spoon to get every last smear of the pie. It took the promise of a ‘good dinner’ to stop me from placing more orders at the Japanese cake shop. Patisserie Flor is located at the slope, right before the rows of Duxton Hill restaurants. The Japanese desserts are reasonably priced around $5-6 for each slice of cake. For lucky ones who work at that district, it is such a blessing because you can now cultivate the new habit of popping by for a tantalizing dessert after lunch! The desserts look so appetising. I only get to see these types of desserts on anime, and they come to real life, great! Hey Brad, thanks for the directions! The cakes look sooo good, I love cakes! Oh does this have seats in the shop? great shots.. i want more!!! You should try the Mont Blanc! Really Yummy! Waguri Millefeuille is awesome too! Why don’t we get together here when I’m in Singapore in January? these look too delicious!! how lucky you are, to have such talent around. Agreed I’d go no holds barred for the strawberry souffle. They all look very scrummy but not sure that I would pay those prices though. I tried the cakes from this place and like mont blanc best. I have also tried Glace. I still prefer Tampopo thou. hi, hearsay the chef has left. Perhaps you might have latest good news to share his whereabout? Thanks in advance. @Jane Let me check, will update you if I know where he has moved to. His new shop is situated at Tanjong Paga Plaza, a little hidden from the mainline of shops but is rather close to the tanjong pagar mrt plaza.